Samsung Electronics has announced the launch of the flagship 4” chic smartphone Wave 3, the social-powerhouse Wave M and the smart-start Wave Y. 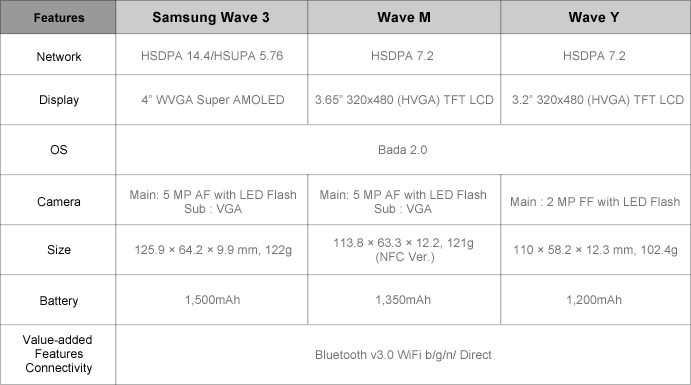 These all wave smartphones will be on display at Samsung’s Stand at IFA 2011 in Berlin. 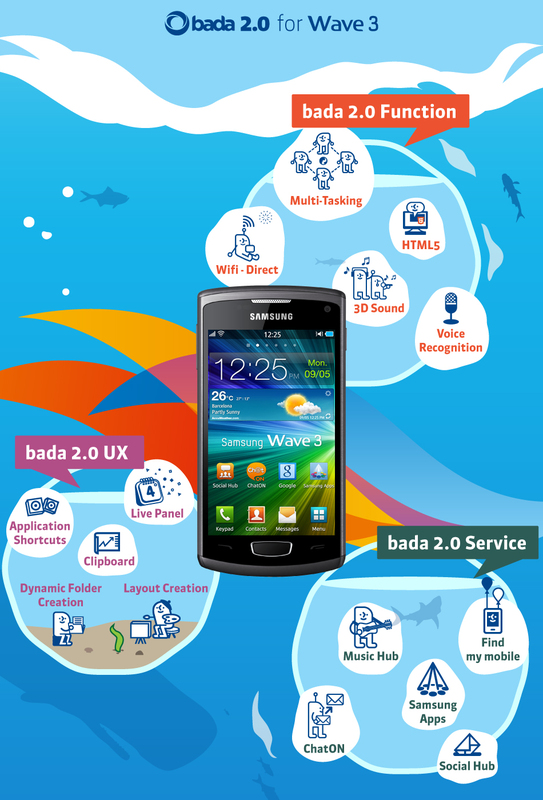 All three devices, borne of Samsung’s heritage in innovation, are powered by Samsung’s own new Bada 2.0 platform which brings together a wide variety of new capabilities including multi-tasking, Wi-Fi Direct, voice recognition and Near Field Communication. ChatON is Samsung’s proprietary mobile communication service that works across all major mobile devices. A global cross-platform communication service links all your friends and contacts instantly. Micro-communities can be set up through group chat, while a web client allows the sharing of content and conversations between mobile and PC. Samsung Apps, an integrated application store for Samsung smartphones, is also available. With an improved UI and enhanced store features, Samsung Apps offers a wide variety of applications from globally well-known content to locally-customized applications. 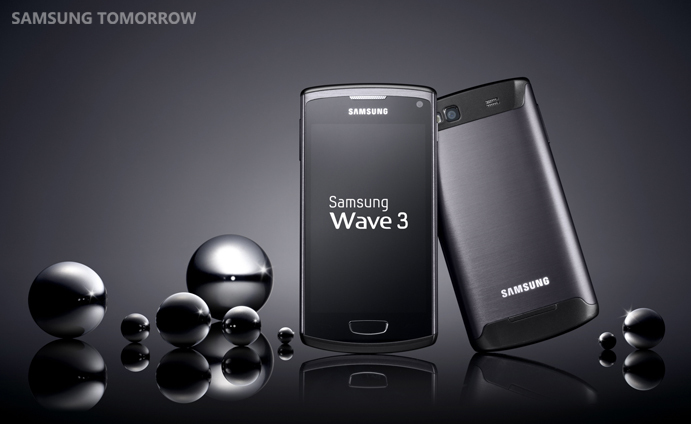 The Samsung Wave 3 is a beautiful and chic smartphone that crams a market-leading 4” Super AMOLED display. Building on the Wave series’ style heritage in full metal design, the Wave 3 is the perfect device for the style-conscious consumer. Excellently constructed of anodized aluminum, the slim yet solid unibody design supports your active, on-the-move lifestyle. With smarter multi-tasking, seamless push notification and Wi-Fi Direct, the Wave 3 has the capabilities to keep you connected and entertained at all times. The Samsung Wave M allows users to keep up-to-date with their hectic social lives with ChatON and Social Hub. With a wide 3.65” HVGA screen made from tempered glass and a metallic body, the Wave M lets users stay socially connected from everywhere. ChatON, streamlined messaging feeds, enhanced on-the-go web browsing and Wi-Fi applications deliver a seamless mobile experience. Wi-Fi Direct and NFC (optional) add further functionality. The Samsung Wave Y is the perfect device to introduce new users to the world of smartphone experiences. With a stylish metallic hairline body and large 3.2” HVGA screen, new users can take their first steps to mobile social networking with Social Hub and ChatON. Simple personalisation is enabled via the Live Panel, Lock Screen and Folder management, while Music Hub, a portable music manager, gives users a jukebox in their pocket. All Functionality, features, specifications and other product information provided and this content, including but not limited to the pricing, design, components, performance, benefits, capabilities, services and availability of the product, may vary by region and are subject to change without notice or obligation.